Distributor element14 has a 7-in. 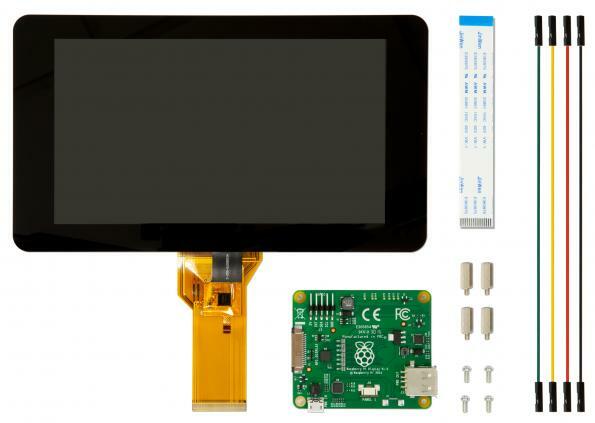 Touchscreen Display for the Raspberry Pi, expanding the ecosystem of accessories, to enable users to create all-in-one integrated projects such as turning their Pi into a tablet, infotainment system or embedded project. Compatible with Raspberry Pi 2, and Raspberry Pi 1 models B+ and A+*, the screen can be used to make ‘Internet of Things’ (IoT) devices with a visual display. Connect the Raspberry Pi, develop a Python script, and create home automation devices with touchscreen capability. A range of educational software and programs available on the Raspberry Pi will be touch enabled, making learning and programming easier. You can download and install the latest version of Raspbian Operating System: the commands ‘ sudo apt-get update ’ and ‘ sudo apt-get upgrade ’ install all of the latest drivers and software to support the touch screen display.